Kenyon’s Writer-in-Residence P. F. Kluge will discuss his global experiences in an upcoming lecture. Writer-in-Residence P.F. Kluge ’64 can’t just visit a place and move on. “When you’re a writer and you go to any place, you’re always looking for material and you’re not done with the place until you’ve written about it,” he said. On day one, from Quest for Justice to an introductory biology course, Kenyon College is a writing school. Writer-in-Residence P.F. Kluge '64 draws on his career as a novelist and journalist to share his unique perspective on a literary life. English major Nate Lotze ’14 honed his writing and batting skills in a dual summer internship. What do wind turbines have to do with peace? Plenty, said Tim Jurney ’15 and Maddy McGrady ’15. Biographer D.T. Max will discuss Wallace and the novelist’s Kenyon connection on Oct. 1. Ever since his 2005 Commencement speech “This is Water,” author David Foster Wallace has been linked with Kenyon. That connection grows stronger when Wallace biographer D.T. Max visits the campus. The Kenyon Review brings Knox Reads! and poet Carl Phillips to the local community. Jake Thorn '14 transitions his career focus from medicine to education by securing an early post with Teach for America. New York Times best-selling author John Green ’00 returned to Kenyon to present, "Thoughts on How to Make Things and Why." Michaela Jenkins, a junior at the South Carolina Governor’s School for the Arts and Humanities in Greenville, South Carolina, took first place in this year’s Patricia Grodd Poetry Prize for Young Writers presented by The Kenyon Review. Best-selling author Ransom Riggs ’01 shares his secret world with Kenyon. Ransom Riggs '01, author of Miss Peregrine's Home for Peculiar Children, talks about his peculiar path to the best-seller list. On Tuesday at dawn, the Kenyon Review’s team of “Ninja” poets stalked the campus to post poems from railings, porch pillars, in the library, and on clotheslines along Middle Path. Award-winning writers Jamal May and Melinda Moustakis have been named 2014-2016 Kenyon Review Fellows. Superstar author and vlogger John Green ’00 shares his thoughts about the upcoming film version of his novel The Fault in Our Stars. Before John Green ’00 was a best-selling author, superstar vlogger and passionate “nerdfighter,” he was a student at Kenyon, where he double-majored in English and religious studies. Pastoral meets academic at the Kenyon Farm, where students work and participate in a sustainable lifestyle. A look into the selection process for the Kenyon Review (and how students play a part). English major Jordi Alonso '14 meets his graduation goal by publishing Honeyvoiced, a book of poetry. Poet Maureen McLane invited by English department to present at Kenyon September 4. As part of a class, students aim to “disrupt” daily life with art installations. Alumnae ring in a new online literary magazine. A Founders’ Day celebration recognizes significant contributions of Kenyon community members. Author and poet Mukoma Wa Ngugi speaks about the unprecedented gain in popularity of genre. Stephanie Mannatt Danler '06 lands a major deal for her debut novel, "Sweetbitter." Essayists gather for writing time, good company and pie. Student associates call the shots at the world-renowned Kenyon Review. "Unbroken" author Laura Hillenbrand ’89 discusses her best-selling book’s journey from page to screen. Scholar and poet Steven Salaita will speak on Palestine and academic freedom. Kenyon is once again a top producer of Fulbright fellows. The Kenyon Review announces the winner of the Patricia Grodd Poetry Prize for Young Writers. Ransom Riggs ’01 announces the final book in his best-selling Miss Peregrine series. Award-winning poet Tarfia Faizullah visits campus to read from her debut collection of work. National Endowment for Humanities professorship awarded to Lobanov-Rostovsky for interdisciplinary project. Poet and Harvard fellow Amir Sulaiman captivates a Horn Gallery audience with a reading. An interactive graph illustrates the relationship between majors and careers of alumni. The Kenyon Collegian hosts a panel discussion with veteran journalists on media’s affect on history. Happy #WorldBookDay! 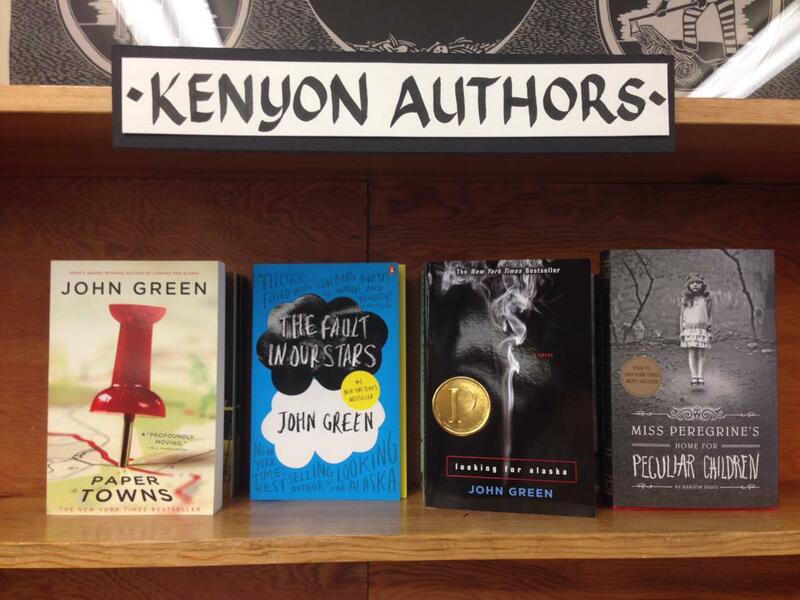 Did you know 4 of 5 current @nytimes YA best-sellers were written by #KenyonCollege grads? A dance performance will explore dreams, comfort zones and relationships. High school students fill notebooks with poetry and prose at the selective Kenyon Review Young Writers Workshop. A professor tries to live lightly alongside first-year students as the faculty-in-residence in Norton Hall. E.L. Doctorow ’52 H’76, who died July 22, is remembered through his Commencement speech to the Class of 1985. Kenyon mourns the passing of acclaimed writer E.L. Doctorow ’52 H’76. SXSW Interactive Director Hugh Forrest '84 leads the way for innovative thinking. Associate Professor of English Jene Schoenfeld uses summer seminars to study slave narratives and black poetry. Economics major Rioghnach Robinson '16 lands a publishing deal for her young adult novel. Helen Forman, longtime College bookstore employee and daughter and mother of Kenyon pioneers, died Saturday, Sept. 12, 2015, at her home in Gambier. Kenyon marks 25 years of the Americans with Disabilities Act with events to explore the idea that everyone thinks differently. Jesseca Kusher ’19, a budding environmental scientist, adds to the talent of Kenyon’s newest class. Kenyon is helping students find work they want to do through an online job board, an internship contest and more. An indefatigable student volunteer sparks Kenyon efforts to aid a local school. Professor Sarah J. Heidt ’97 poses important questions to the Class of 2019 in the traditional Founders’ Day address. A junior reflects on some of Kenyon’s more unique course offerings. Students transform an extra room into a gallery that passers-by can view through the window. Aspiring journalist Henri Gendreau '16 is planning for his future through internships and his work as Collegian editor. Two students and one alumna receive prestigious DAAD scholarships to study in Germany. The Alumni Bulletin’s book editor reflects on this year’s notable Kenyon books. From basement couches in a gingerbread-like cottage, students have the big job of helping choose submissions for the prestigious Kenyon Review literary magazine. In "Our Town," students chronicle the lives and deaths of residents from the fictional Grover’s Corners. Beverly Tatum, a psychologist and author specializing in how race functions in education, leads a discussion and workshop at Kenyon. Kenyon is named a top producer of Fulbright winners for 12 consecutive years. Twentieth Century Fox releases the movie trailer for “Miss Peregrine’s Home for Peculiar Children,” based on the Ransom Riggs ’01 best-seller. With three Kenyon records, Sam Lagasse ’16 runs toward national track and field championships. Stephanie Danler ’06 earns widespread praise as her debut novel, "Sweetbitter," hits shelves. In the wake of recent attacks around the nation, the Kenyon community discusses ways to cope and empathize. The Kenyon Review hosts a reading of “Sweetbitter” with Stephanie Danler ’06. Stephanie Danler '06 reflected on her Kenyon experience during a Kenyon Review reading of "Sweetbitter." Writer-in-Residence P.F. Kluge '64 interviews his former student turned best-selling author Stephanie Danler '06 in a "Kenyon Review" podcast. For George Stone '95, editor-in-chief of National Geographic Traveler, the world is his office. The Kenyon Review's Patricia Grodd Poetry Prize draws three high school writers to Kenyon. MacArthur Fellow Lauren Redniss speaks about her innovative work in visual nonfiction. In events at Kenyon, notable science writers Lauret Savoy and Andrea Wulf examine how race, politics and nature intersect. Associate Provost Ivonne Garcia will be the first Latina to deliver the Baccalaureate address at Kenyon. In her Baccalaureate address, Associate Provost Ivonne Garcia reminds the Class of 2017 that "failure may be the best thing that ever happened to you." Known for her generosity of spirit and skills as a writer and editor, Amy served the Kenyon community in multiple capacities during a career spanning more than two decades. Justin Martin '19 fights for his status quo. A Young Writers Workshop graduate returns to work for the Kenyon Review program. Kenyon gives students the support to develop into great writers across disciplines. Kenyon’s alumni network helps English major Amy Shirer ’18 take her internship to the next level. The Class of 2018 chooses Associate Professor of English Sarah Heidt ’97 to dispense advice as Baccalaureate speaker. A new English office building is the first completed part of Kenyon’s West Quad project. Kenyon’s new English building, Keithley House, channels historic Sunset Cottage while honoring Marilee Keithley Roche P’95.